Well....day one was kind of a bust. I have to tell you, March is such a strange month in Missouri. It can be warm and sunny one day and the next day, icy and snowy. We got a bunch of sleet on Saturday night, followed by a couple of inches of snow yesterday. The roads were icy, but I think they really canceled school because it's just so dang cold. 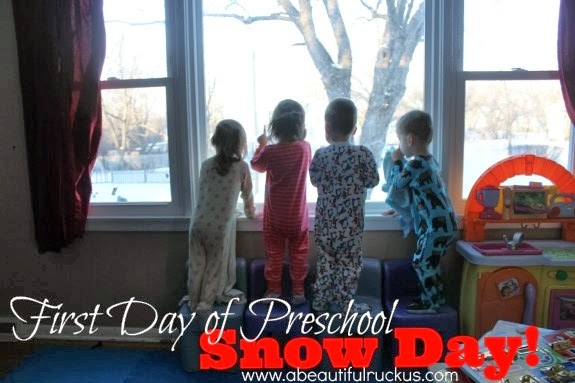 My big question is, if they are starting their school career off on a snow day, what does that mean for the future?! That is a cute picture of them in their jammies. Sorry it was a snow day. I hope they love their new school : 0 ). Not a very good start. This weather has been so crazy this winter! Hopefully they won't have any more snow days. I'm sure it would be good for everyone to get into a good routine. But oh well, can't control Mother Nature.